Here are essential “good to know” details before you visit Pogoni. 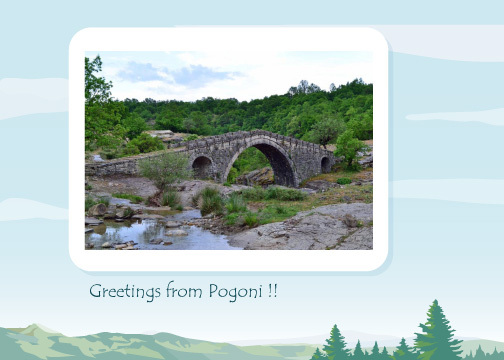 Pogoni has a population of 11.092 inhabitants , extends to 701 square Km. and consists of the villages of Agia Marina, Agios Kosmas, Argyrochori, Vassiliko, Vissani, Delvinaki, Dimokori, Dolo,Drymades, Zavrocho, Kakolakkos, Kastaniani, Lower Merope, Kerasovo, Kefalovriso, Krioneri, Ktismata, Lavdani, Limni, Mavropoulo, Merope, Mountain-Xirovalto, Palaiopyrgos, Peristeri, Pontikates, Pogoniani, Roupsia, Stafroskiadi, Psilokastro, Stratinista, Teriachi, Faraggi, Haravgi, Oraiokastro. Hellas in general has Mediterranean climate. Pogoni has a short period of ice only between December and February. Heavy Snow is falling during Winter on the mountains. Summer is typically Mediterranean (hot dry days, cool nights ).May rain during Summer. Weather conditions may sometimes change rapidly, depending on the season. Hellas is an EU-member and follows the provisions of the Schengen Agreement. Travelling in, to and from Hellas an identification card is required for citizens of European Union. Passports are needed for currency exchange. Visas are required for countries that are not members of the Schengen Agreement. In Hellas visitors are protected by the National Consumer Law.